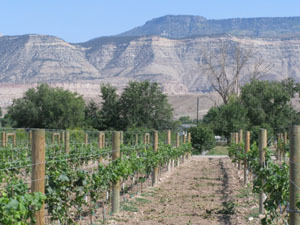 They now grow award-winning fruit that was sampled by Michelle Obama and her girls when the trio visited High Country Orchard during President Obama’s 2008 campaign stop in Grand Junction. But every year hundreds of people, visitors from far and near, come for tours and shopping during July and August (Tours by appointment at other times). The Highs bought their first peach orchard in 1999 intending to turn the 10 acres into their starter vineyard. But when they tasted the peaches growing there, they knew the trees would have to stay. From that first land purchase, their facility has grown to 126 acres—now planted with 15 varieties of tree-ripened peaches, 3 varieties of sweet cherries, red and white wine grapes, and fresh garden vegetables. 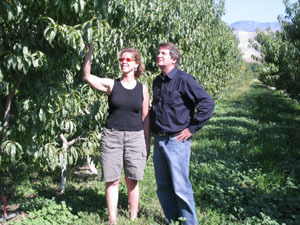 With Scott’s background in agriculture and Theresa’s knowledge of marketing, they have the perfect combination of skills for operating a successful orchard. But they have taken working efficiently and putting out the best possible product to a new level. It starts with their growing technique and ends with their specialized high-tech equipment for analyzing, sorting, and packing peaches. “We thin aggressively, pinching off 90 percent of blossoms in the spring,” Scott says. “That gives us quality rather than quantity. Later we only pick ripe fruit, and only from sunrise to noon, when it is juicier. If you pick a peach at 4:00 or 5:00 p.m. it’s a little flat,” he adds. Picked peaches are immediately pre-chilled; the Highs do not wash, wax, or brush the fuzz away. Packing occurs from 1:00 to 3:00 p.m. each day during the season, after which trucks arrive to haul pallets to distributors. High Country Orchard peaches, which are all from three to three and a half inches in diameter, are on the shelves of Colorado stores like Whole Foods and Kroger within 24 hours of picking. 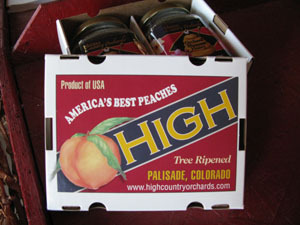 How can they get as many as 2000 boxes (40 items per box) of tree-ripened peaches ready to ship every afternoon? The solution lies in their customized packing line. Designed by Scott, engineered in France, and fabricated in California, the technology involves using two high-speed digital cameras that take seven spherical pictures of every peach as it passes along the conveyor belt. In 0.6 seconds the computer notes size, weight, color, and any imperfections and uses the calculations to determine which of nine foam-cushioned packaging lines to drop it down into. Six to 10 minutes after the peach leaves the pre-chiller, it is ready to be loaded onto the truck. The machine also weeds out any bad peaches that may have escaped the sorters, and Theresa uses these to make delicious preserves, salsas, and grilling sauces in her commercial kitchen. These are sold on-site and through mail order. About that vineyard Scott promised Theresa: The first bottles of cabernet sauvignon from grapes grown on their farm hit shelves to rave reviews in 2010.